In any electrical machine, 'loss' can be defined as the difference between input power and output power. An electrical transformer is an static device, hence mechanical losses (like windage or friction losses) are absent in it. A transformer only consists of electrical losses (iron losses and copper losses). Transformer losses are similar to losses in a DC machine, except that transformers do not have mechanical losses. Eddy current loss and hysteresis loss depend upon the magnetic properties of the material used for the construction of core. Hence these losses are also known as core losses or iron losses. Eddy current loss in transformer: In transformer, AC current is supplied to the primary winding which sets up alternating magnetizing flux. When this flux links with secondary winding, it produces induced emf in it. But some part of this flux also gets linked with other conducting parts like steel core or iron body or the transformer, which will result in induced emf in those parts, causing small circulating current in them. This current is called as eddy current. Due to these eddy currents, some energy will be dissipated in the form of heat. Copper loss is due to ohmic resistance of the transformer windings. Copper loss for the primary winding is I12R1 and for secondary winding is I22R2. Where, I1 and I2 are current in primary and secondary winding respectively, R1 and R2 are the resistances of primary and secondary winding respectively. It is clear that Cu loss is proportional to square of the current, and current depends on the load. Hence copper loss in transformer varies with the load. Just like any other electrical machine, efficiency of a transformer can be defined as the output power divided by the input power. That is efficiency = output / input . Transformers are the most highly efficient electrical devices. Most of the transformers have full load efficiency between 95% to 98.5% . As a transformer being highly efficient, output and input are having nearly same value, and hence it is impractical to measure the efficiency of transformer by using output / input. 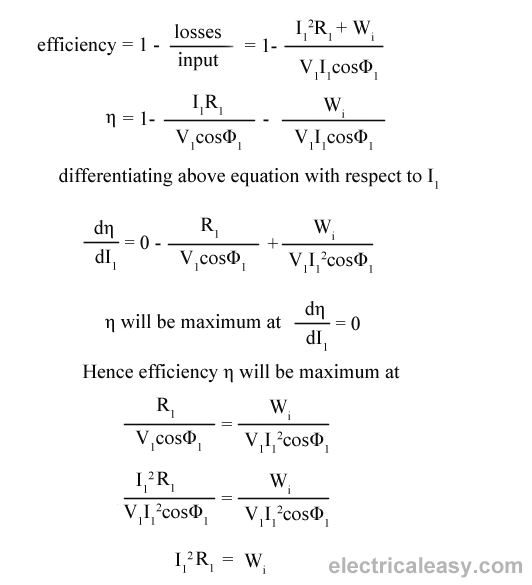 A better method to find efficiency of a transformer is using, efficiency = (input - losses) / input = 1 - (losses / input). Hence, efficiency of a transformer will be maximum when copper loss and iron losses are equal. That is Copper loss = Iron loss. But in some types of transformers, their performance can not be judged by this efficiency. For example, distribution transformers have their primaries energized all the time. But, their secondaries supply little load all no-load most of the time during day (as residential use of electricity is observed mostly during evening till midnight). That is, when secondaries of transformer are not supplying any load (or supplying only little load), then only core losses of transformer are considerable and copper losses are absent (or very little). Copper losses are considerable only when transformers are loaded. Thus, for such transformers copper losses are relatively less important. The performance of such transformers is compared on the basis of energy consumed in one day. All day efficiency of a transformer is always less than ordinary efficiency of it.